OPSEK: After ISS – the Next Mir? Space Safety » Archive » Space Exploration » International Space Station » OPSEK: After ISS – the Next Mir? A proposed concept for OPSEK in 2011 (Credits: Roscosmos). In June 2011 cooperating countries agreed to finance the International Space Station (ISS) Program until 2020 with the possibility to operate it until 2028. ISS represents the beginning of a new space era and an excellent example of international peaceful cooperation for the advancement of scientific knowledge. The future of this piece of space history remains unclear. The ISS program, whether it will end in 2020 or 2028, may not just finish with a complex deorbiting operation, but could be converted for use in a new project, operated by Russia, called the Orbital Piloted Assembly and Experiment Complex (OPSEK). – Below, a CGI reconstruction of the destructive reentry of the International Space Station. Former head of Russian Federal Space Agency Anatoly Perminov officially informed its ISS partners about its intention to “build and prepare for operation the first elements of the orbital assembly and experimental piloted space complex by the end of the ISS life cycle,” in June 2009. The initial architecture of the OPSEK complex would be built out of modules originally planned for the Russian segment of the ISS. “If the need arises, we could undock the new modules [from the ISS], starting with the MLM, and they will serve as a foundation for a new generation Russian space station,” said Alexander Derechin, deputy chief designer for Russia’s space corporation RKK Energia, said at a scientific forum in Moscow. 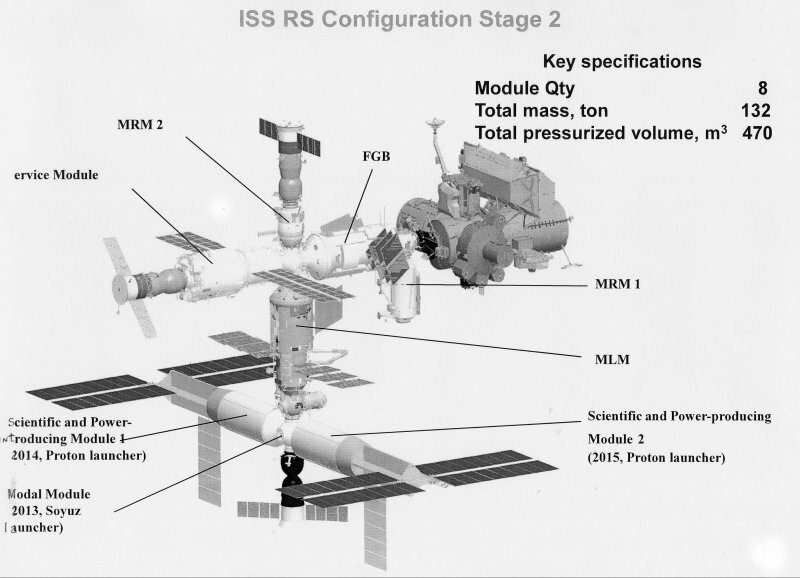 OPSEK’s final design would depend on when ISS is retired and the readiness of the latest Russian modules at that time. According to RussianSpaceWeb, in October 2012 RKK Energia leadership approved the launch of the MLM Nauka module, scheduled for Dec. 11 2013, enabling a docking of the spacecraft to the Zvezda Service Module on the Russian segment of the ISS. It seems, however, that MLM is not likely to actually lift off before 2014. OPSEK’s configuration evolution (Credits: Roscosmos). OPSEK station has inherited the project criteria initially planned for the Mir and Mir-2. The former ISS Russian modules would be assembled and placed into a high-inclination orbit to serve as a platform for Earth observation at high latitudes, encompassing most of the Russian territory. This decision results from the fact that, despite Russia having originally planned a high inclination orbit for Mir-2, Roscosmos abandoned Mir-2 for cooperation with US on ISS in 1993. Cosmonauts onboard the ISS could only see a small fraction of the Russian territory due to the station’s orbit, calculated to allow Launches from Cape Canaveral that would not be possible into the high-inclination orbit. According to Vitaly Davydov, deputy chief of the Federal Space Agency in 2006, the orbit of the new station would have an inclination of 70 degrees toward the Equator, as opposed to 51 degrees for the ISS. 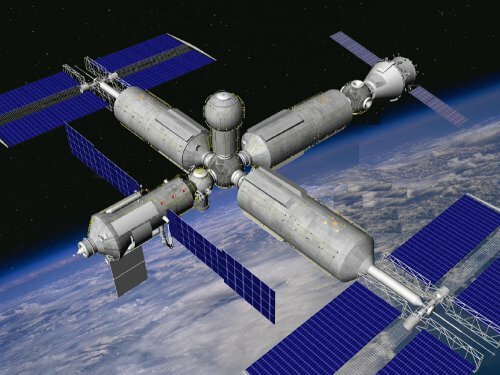 Russia had announced the possibility to use Russian ISS modules to build a new space station earlier, during the 5th International Aerospace Congress in Moscow on August 29, 2006. The difficult economic situation prevented Russia from finalizing the proposal, however the project was never abandoned by Russian decision makers. In April 2008, Perminov said that the nation’s Security Council approved the plan in general, without however setting a timeframe. In the intervening time, OSPEK acquired additional functions such as to serve as a foundation for the lunar program and, later, for expeditions to Mars. Prime Minister Vladimir Putin on July 19, 2010 suggested that the completion of the Russian segment of ISS should be accomplished in 2015. However, the absence of a confirmation of such a project until now does leave the door open to other alternatives for the end of the ISS. This highlights the urgency of long term space program strategy, as there are currently no follow ups to the ISS program planned. Today, april 2014, u.s. and russia cooperation is difficult. U.s. Have no programs for a new station after iss. U.s. Needs a new station after iss, so nasa should begin to project it now, because it’s a long term operation. U.s. Can’t build a new station in one month. U.s. Needs international cooperation with germany (ESA) and Japan to project and build a new station. Where? Earth orbit, moon orbit, lagrange points? How.. The u.s. .. Can go to mars.. Without a new space station after 2024? The cost of a space station is, like iss, about 30 billion dollars. Where nasa, Germany and Japan can find so much money, and also the money to go to Mars? Why nasa don’t talk about the next iss? If they want a new station in 2024/2025, they should begin to project it now. Instead of go to mars.. Is better to build a smaller station in earth orbit after iss, and go to the moon, and build a small moon base, for experiments about low gravity, animal reproduction experiments in low gravity (without reproduction in low gravity, we can’t colonize mars) using the moon as a proving ground for mars? Good questions, Giorgio, and ones that many throughout the space world have been discussing. There is widespread agreement that ISS is a necessary platform for the research and development needed as a predecessor to a long term deep space mission. However, there is no agreement that another space station is needed as a follow on. I would agree it makes sense, but there might be a Chinese station and even a commercial station by that point…nevertheless, good things to think about!